Kigali, April 7: Rwanda on Sunday marked the 25th anniversary of the 1994 genocide in which about a tenth of the African nation's population was killed. The country will mourn for 100 days, the time it took for 8,00,000 Rwandans to be massacred, the BBC reported. Most victims were minority Tutsis, killed by ethnic Hutu extremists. 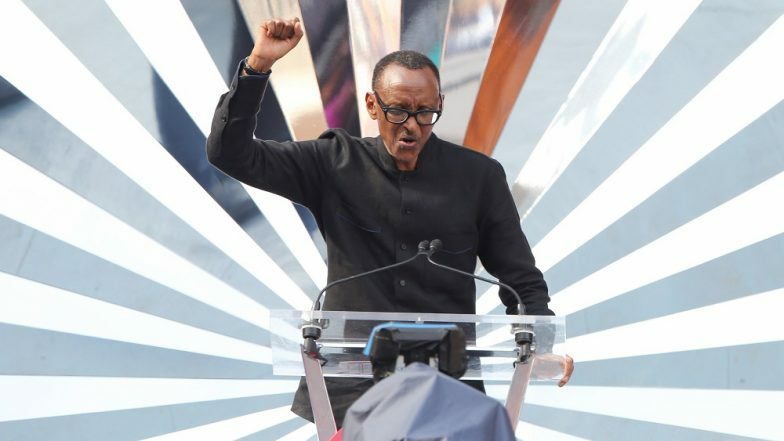 Paul Kagame, 61-year-old President, who led the rebel force that ended the genocide, started the commemoration by lighting a remembrance flame at the memorial in the capital Kigali, where around 2,50,000 victims are said to be buried. The flame will burn for 100 days. Kagame will make a speech at the Kigali Convention Centre and then lead a vigil at the Amahoro National Stadium, which was used by UN officials to protect the Tutsis during the killings. On April 6, 1994, a plane carrying then-President Juvenal Habyarimana, a Hutu, was shot down, killing all on board. Hutu extremists blamed the Tutsi rebel group Rwandan Patriotic Front (RPF) for it. But the RPF denied the accusation. India Extends USD 200 Million Lines of Credit to Rwanda, to Open a High Commission in Kigali. In a well-organised campaign of slaughter, militias were given hit lists of Tutsi victims. Many were killed with machetes. One of the militias was the ruling party's youth wing, the Interahamwe, which set up road blocks to find Tutsis, incited hatred via radio broadcasts and carried out house to house searches.